For The Month Of March 2019 – Implants & Ortho for $2500 when paid in full. At Edge Dental you will find a committed and highly-qualified team, dedicated to creating and restoring beautiful, healthy smiles. Justin Lai, DDS, provides quality general and cosmetic dentistry services. Edge Dental is a high-tech, modern, state-of-the-art dental office with a focus on cosmetics, implants and gum disease. TO BETTER ACCOMMODATE YOUR BUSY SCHEDULE! As a native Houstonian, Justin Lai, DDS is excited to serve his hometown, the Memorial Area and Energy Corridor. Dr. Lai attended J Frank Dobie High School and studied Chemical Engineering at Rice University before receiving his Doctor of Dental Surgery degree from the University of Texas Health Science Center at San Antonio Dental School. 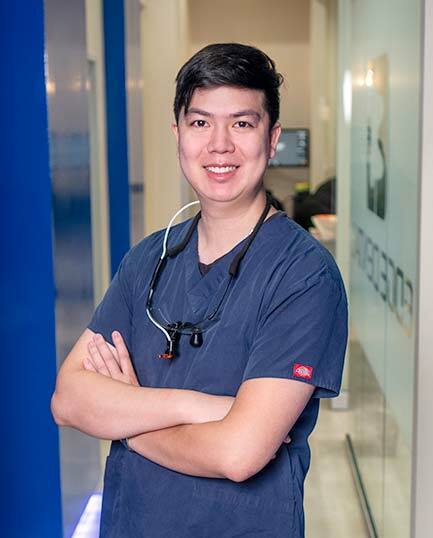 With his engineering background, Dr Lai is able to think outside the box and find practical and effective solutions for his patients that other dentists may overlook. His philosophy is simple: pay great attention to detail, do it right the first time, and treat patients with the utmost respect and care. Dr. Lai is a strong advocate of continuing education to stay ahead of the curve and has taken over double the minimum number of required hours. Dr Lai is also a proud member of the ADA, TDA, GHDS, and IALD. Dr Lai is an Eagle Scout and gives back to the community whenever he can. When he isn’t in the office, Dr. Lai spends his time outdoors where he enjoys playing golf and tennis. At Edge Dental, your bright, healthy smile is our top priority. Of course, you’ll only smile if you’re as happy with our service as you are with our dental treatment. That’s why we take the time to listen to your needs and concerns. Not only do we listen to your concerns, but we use gentle, efficient cleaning techniques. We also hire caring, highly trained professionals. Our experienced team of specialists is invested in meeting all of your dental needs; from calming anxieties to teaching good habits, from regular check-ups to sophisticated dental surgery. Edge Dental is a fantastic dental office, it is so clean, very professional staff. I had a crown that fell out over Easter weekend. He has a very professional staff, and this was a very good experience. Dr. Lai is incredibly knowledgable and personable! My Visit Was Delightful And Painless. My Visit was delightful and painless. They use the most modern technology in their teeth cleaning procedure. Came back for my cleaning today and Dr. Lai answered all my questions. He also scrutinized an area of concern we will check again if it doesn’t improve in a couple of weeks. Your teeth perform numerous important functions. They are essential for biting and chewing food. They enable you to speak by controlling airflow. They are also a key factor in your appearance. A beautiful smile not only creates a lasting positive impression on those around you, but it can also play a significant role in your confidence. When your teeth are less than perfect, this has a major impact on your smile, affecting the quality of your smile. This can also lead you to become for self-conscious, causing you to smile less (which can lead others to believe that you are unfriendly). At Edge Dental we provide affordable cosmetic dentistry options to help restore the beauty of your teeth, giving you back your confident smile. A dental implant, made from porcelain and titanium, is an artificial tooth-like structure that is used to replace a missing tooth. It can be said to be a perfect tooth replacement. Generally, the traditional dental treatments for cosmetic problems, which include dental bridges, dental crowns, and dentures, can only solve the cosmetic problems of missing teeth in the short-term and not permanently. Basically, these traditional dental processes cannot prevent bone loss. For instance, for the dental crown and dental bridge procedures to be successful, healthy teeth must be ground down to serve as anchors to hold the dental bridge and crown. This, however, leaves the healthy teeth at a higher risk for endodontic failure and cavities. More so, dentures may eventually become unstable and uncomfortable as the jawbone shrinks. This may subsequently lead to eating and speech problems. However, dental implant just like the natural tooth transmits chewing forces into the jaw. This stimulates the jawbone and stops bone loss. A dental implant is a perfect option for those who have lost a tooth or teeth due to either injury, periodontal disease, or any other reasons. Read more about dental implant here. Like in the natural teeth, the dental implants crown is the tooth-like part of the implant that is fixed on the external end of the implant, while the dental implants root is the part with the abutment that is fixed into the jaw to hold the replacement tooth/teeth. Dental implants are the most efficient for dental reconstruction to restore your healthy teeth. Most leading dental clinics like Edge Dental Houston recommend dental implant as the best dental option for tooth replacement. The dental implant is undoubtedly the most effective way of replacing a missing tooth. The dental implant contains parts that perfectly mimic the function and behavior and of the natural tooth (crown and root). When there is a missing tooth, the jawbone tissue would no longer be stimulated. Hence, it would begin to deteriorate but using a dental implant as a replacement tooth stimulates the jawbone to promote a healthy jawbone tissue. More so, the dental implant crown is made of porcelain, which looks like the natural tooth. So, it is nearly impossible for anyone to notice if you have one. Also, the dental implant requires the same dental maintenance and oral care as natural teeth. So, you wouldn’t be going extra miles to maintain your implant. Unfortunately, not every dentist can perfectly install a dental implant. For instance, a well-trained dentist must first examine if the patient has healthy and sufficient bone tissue to support the implant, otherwise, there would be a bone grafting procedure before the implant is installed. Are you dealing with missing tooth/teeth or other dental cosmetic problems? Don’t hesitate to schedule an appointment with any of our professional dentists today. Call (281) 940-8940 today or visit our website to reach Edge Dental Houston. To learn more about the benefits and costs associated with dental implant procedures, click here. Orthodontics is a special aspect of dentistry that deals with the alignment of the jaws and teeth using dental braces to improve oral health and a patient’s smile. Crooked teeth are very difficult to keep clean because they do not fit properly together and are at higher risk of being infected with gum disease or tooth decay. The orthodox orthodontic treatment is the metal brace track and metal aligners that are attached to the surface of the teeth to straighten it. However, this can sometimes give an ugly or frightening sight. Orthodontic treatment has recently undergone significant improvement, which led to the development of a more efficient, easy to use, and user-friendly treatment known as Invisalign. Click here to know more about Invisalign and its benefit over the traditional metal brackets. Invisalign is an improved type of orthodontic treatment for straightening the teeth that do not require the use of the traditional metal brackets. Do you need to undergo an orthodontic treatment but scared of having ugly metal brackets on your teeth? Now you have a better option with Invisalign. Invisalign also called clear aligner treatment, are clear plastic form, custom-made, transparent dental braces (orthodontic devices) that are used to adjust the teeth. Invisalign are customized based on the patient’s teeth arrangement and worn to help shift the teeth of the patient in the right position. Are you considering Invisalign braces? Why don’t you give it a try today? Typically, Invisalign cost more than the traditional metal brackets. According to the manufacturer, the cost of Invisalign braces is about $3,500 to $8,000, while the cost of the traditional metal braces is about $2,500 to $6,000. Visit Edge Dental Houston for a better estimate of the cost of Invisalign treatment. Actually, the average cost of Invisalign treatment depends on the extent of the Invisalign treatment, the number of aligners you would need to complete the treatment, and individual needs. However, check with your insurance company to first know if your dental insurance plan covers Invisalign. It is recommended that you visit a well-experienced orthodontist before deciding on the best orthodontic treatment for your case. The average cost of Invisalign treatment is not much higher than the average cost of the traditional metal bracket, whereas Invisalign offers more unique advantages than the metal brackets. For instance, you can easily remove Invisalign from your teeth before brushing and eating, and you can easily fix it back without the help of a dentist. More so, Invisalign is clear enough that nobody may easily notice it on your teeth when you give that improved smile. Hence, the benefits associated with Invisalign outweigh its slightly high price. If the Invisalign cost seems like a big concern to you, you can discuss with us today about convenient payment options. At Edge Dental Houston, we offer pocket-friendly services and flexible monthly payments for your Invisalign treatment. 6 Month Smiles also an aligner for the straightening of crooked teeth. It is an effective and quick alternative to the traditional metal brackets. 6 Month Smiles also consists of wire and brackets to straighten crooked teeth and close unnecessary gaps but is tooth-colored to give a perfect blend to the natural teeth. Unlike the typical metal braces, 6 Month Smiles focuses only on the orthodontic treatment of the front teeth, commonly called the Social Six. This makes the treatment time greatly reduced, not later than six months duration. More so, since the 6 Months Smiles aligner affects only the front teeth, it requires less force, which makes it more comfortable than the metal brackets. Just like its name, 6 Month Smiles is designed to straighten your teeth in just six months. Hence, it offers minimal discomfort and quick results and you wouldn’t have to bear brackets on your teeth for two years to straighten your teeth. You can read more about 6 Months Smiles from here. 6 Months Smiles moves your teeth gently and faster into correct alignment. More so, it is less expensive than the traditional orthodontic treatments. 6 Month Smiles uses clear tooth-like materials that are almost invisible, it offers the shortest period of orthodontic treatment, it is generally cheaper than other orthodontic treatments, and it exerts less force when moving your teeth in place. 6 Months Smiles is mostly referred to as ‘short-term orthodontic treatment’ because of its quick action and focus on only the front teeth. If you are considering opting in for 6 Months Smiles orthodontic treatments, here are some benefits of 6 Months Smiles that can help you to make a better decision. The greatest benefit of 6 Month Smiles is that it takes about 6 months to fix your cosmetic problems and give you a perfect smile. Although a comprehensive orthodontic treatment using 6 Months Smiles takes a longer period of about 12 to 18 months. The truth about 6 Month Smiles orthodontic treatment is that it is faster because it only straightens the front teeth and not because it moves the whole teeth faster. 6 Month Smiles uses clear tooth-colored wires and brackets, which blend unnoticed with your natural teeth. As clear braces are becoming popular among patients with cosmetic problems, 6 Months Smiles a better option coupled with its short-term treatment. Another great benefit of 6 Month Smiles orthodontic treatment is its low price. In most cases, 6 Month Smiles is less expensive than the conventional metal bracket orthodontic treatment. Though, this often depends on the treatments offered by your dentist or orthodontist. To find out more about orthodontic treatment using 6 Months Smiles please click here. To find out whether 6 Month Smiles would be the right option for you, contact us today and our professional orthodontist would be happy to attend to your dental needs. An attractive dental appearance is a function of the arrangement and shape of the teeth and how they relate to the lips, gums, and facial features. It is critical that you achieve such an attractive dental appearance, though achieving it is not always easy. Depending on your dental condition, your dentist may prescribe different types of dental procedures to you, which include dental bonding, cavity filling, and teeth cleanings. In severe cases, wisdom tooth extractions and cavity fillings procedures may be conducted and aesthetic crowns are often prescribed too. Aesthetic crowns, also called dental crowns, are protective dental caps or dental covers that are fitted over existing teeth to conceal defects, such as discoloration, chips, or cracks. Aesthetic crowns are recommended dental procedures to patients who wish to improve their smiles and the general look of their teeth. Aesthetic crowns are metal-free and can beautifully and realistically mimic your natural teeth. To learn more about aesthetic crowns, please visit our dental crowns page or contact us to schedule an appointment with us. Improve your overall teeth shape, alignment, and appearance. Aesthetic crowns are one of the cheapest and easiest ways of improving your oral health and the beauty of your smile. Aesthetic crowns coupled with consistent dental hygiene can give you a lasting solution to your cosmetic problems. To learn more, click here. Aesthetic crowns may be the lasting solution you need for your dental restoration. So, it is advisable that you consult a well-trained dentist for an appropriate dental treatment for you. Aesthetic crowns can be made from different materials, the kind of material you choose for your aesthetic crown would affect the appearance, cost and the amount of preparation involved in your aesthetic crown procedures. To learn more about the various types of aesthetic crowns available, please visit our dental crowns page or contact us to schedule an appointment with us. Laser Gum Therapy, generally known as Laser-Assisted New Attachment Procedure (LANAP), is a treatment procedure approved by FDA for gum disease. In fact, it is the only FDA-approved laser therapy for periodontal disease treatment. Laser Gum Therapy is an advanced and relatively new treatment option for periodontal disease. Unlike in traditional periodontal surgery where a scalpel is used, LANAP uses a more precisely-focused laser to eliminate the diseased gum tissue without infecting or causing harm to the healthy gum tissue. During Laser Gum Therapy, the bad bacteria and diseased gum tissue are not only destroyed, but the therapy also stimulates the natural regenerative ability of the body. Hence, LANAP prevents the need for gum grafting around the infected tooth. Edge Dental Houston has well-trained and professional dentists and periodontists who can efficiently use LANAP to treat gum disease. Do you have any periodontal disease? Don’t hesitate to schedule an appointment with one of our specialist dentists today. Remember, if periodontal disease is left untreated, it can cause your gums to recede, bone loss, and eventually, tooth loss. Laser Gum Therapy can be used to reverse the gum disease as it is the only clinically and scientifically proven treatment to regenerate both bone and soft tissue. LANAP offers the following benefits. During LANAP, patients experience much less discomfort both during the procedure and after than during the standard gum surgery. More so, LANAP undergoes a faster healing process, which is less than 24 hours. After this period, you may choose to eat anything you want. Typically, LANAP requires you to make 2 two-hour visits to your periodontist and just two follow-up visits afterward, compared to conventional surgery using a scalpel, which usually requires 4 sessions of about an hour each, in addition to several visits afterward for check-ups and suture removal. LANAP involves a minimally invasive nature. Hence, there is a maximum protection of your healthy gum tissue. More so, Laser Gum Therapy is safe for patients with complicated health issues like haemophilia, HIV, or diabetes. It is also safe for patients taking medications, such as Aspirin or Plavix. Laser Gum Therapy offers long-lasting treatment for periodontal diseases. To learn more about LANAP Laser Therapy and its benefits, click here. To find out if Laser Gum Therapy is the right treatment for you. Call our office on (281) 940-8940 or visit our website to schedule an appointment with any of our professional Edge Dental Houston Laser Gum Therapist.